The shop’s new location is in Uptown, on 2509 Broadway St. 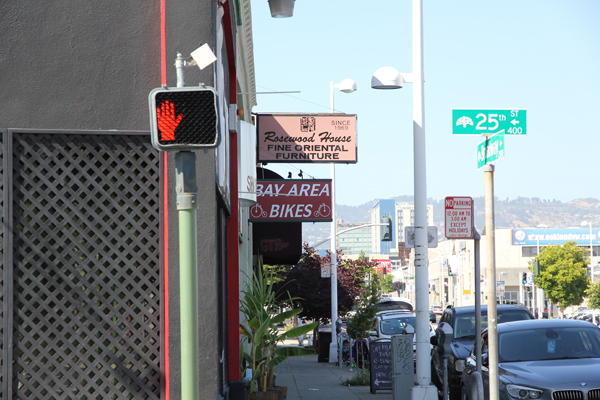 I passed by and discovered this bike shop called Bay Area Bikes at 2424 Webster St. when I was going to a car rental nearby. It is ironically situated in an area (Auto Row in Oakland) that is filled with car dealerships. Stick it to them, Bay Area Bikes! When I walked in and spoke with Clay who owns the place with his wife, Glenda, I knew this shop was for me. They are great people who believe in making the community livable through biking, and they carry quality bikes because they don’t believe in “race to the bottom prices”. They have bikes and accessories that I really like and they appear to carry bikes for everyday folks, in addition to performance bikes. 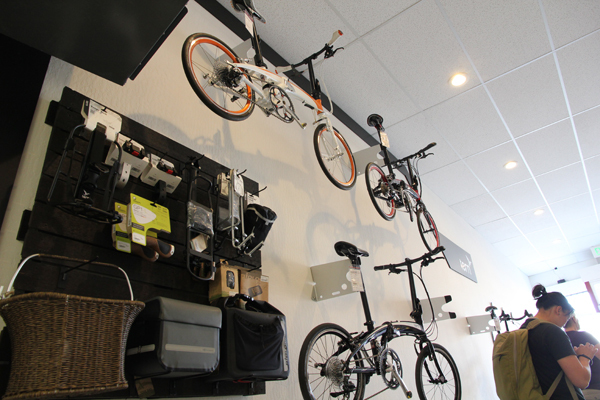 A nice display for Tern folding bicycles. Here is a review from a friend, Kristen, that I think says it all about Clay and his bike shop. One day on the ferry to work, I told her about Bay Area Bikes, and she said, “That’s where I got my bike!” She said that at first, she went to at least 4 to 5 shops all over Oakland and everyone ignored her completely. I have always felt that bike shops intimidate women, particularly women that are buying a bike for the first time, and Kristen is in this category. 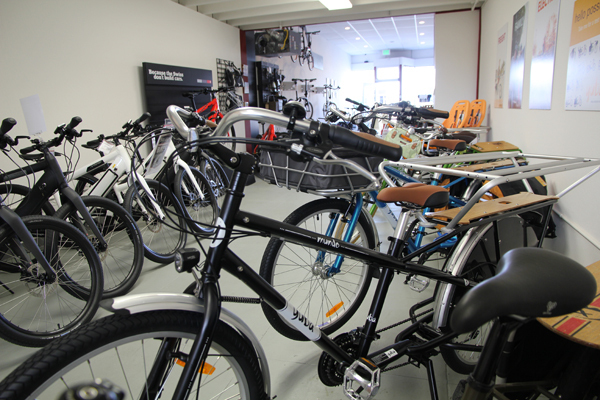 Most shops carry mostly performance bikes, the employees are usually men, and the way the bike shop looks exudes masculinity. But this particular shop is different from the norm. These words were taken from our conversation: “When I got to Bay Area Bikes, I was immediately greeted and treated with respect. I had no idea what I needed or wanted, other than a good-for-commuting bike that wouldn’t hurt my back. They suggested a Tern folding bike, demonstrated to me, and let me try out the bike, but I still wasn’t sure if it would hurt my back. They then recommended me to go rent one for a day at their Bay Area Bike Rentals in Jack London Square, but then a friend let me borrow one for a whole week. So I tried it and and went back to Bay Area Bikes.” She got everything from them, from a bike helmet and lock to a commute bag and her dear Tern Link D7i folding bike. She says that through the whole process “everyone was friendly and helpful, and to this day every time I go in for a service (or yet another accessory) they are just as nice and easy to work with, and they never talk down to me.” A great recommendation from a new devoted customer! Yuba Mundo cargo bikes for families, rated #1 by the Danish Cycling Federation (No kidding! From a country known for its cargo bikes). You can get these cargo bikes electric-assisted too! There are four locations of Bay Area Bikes now. One is in Pittsburg and the other three are in Oakland. 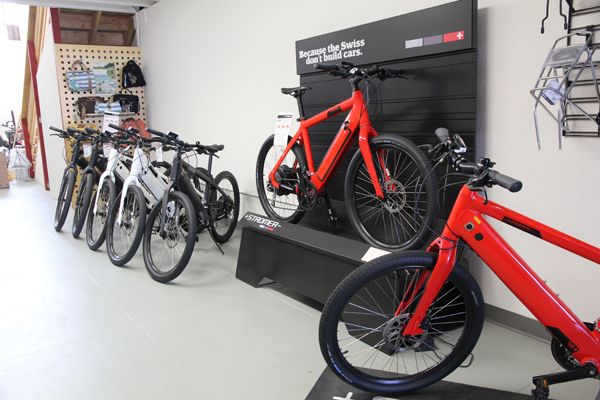 One is a bike rental in JLS as I mentioned earlier; the second is in Uptown and carries commuter and performance bikes. The newest shop just opened about a month ago at 2509 Broadway and 25th Street, which sits in between an Ethiopian restaurant and Smythe’s Accordion Center (yes…that folksy instrument, accordion!). It’s a nice and niche bike shop. Why do I like this shop particularly? 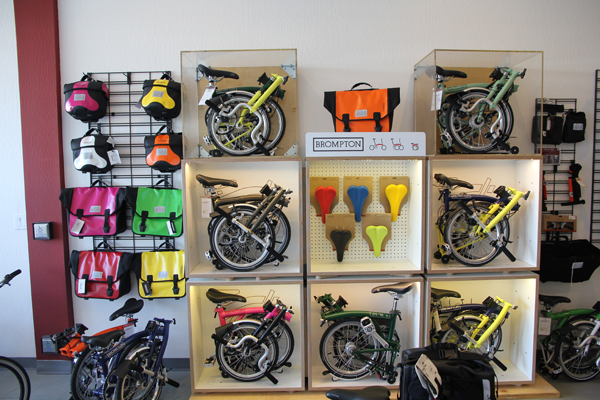 They are the only Brompton authorized dealership in town and secondly, they fill a niche that most bike shops don’t. 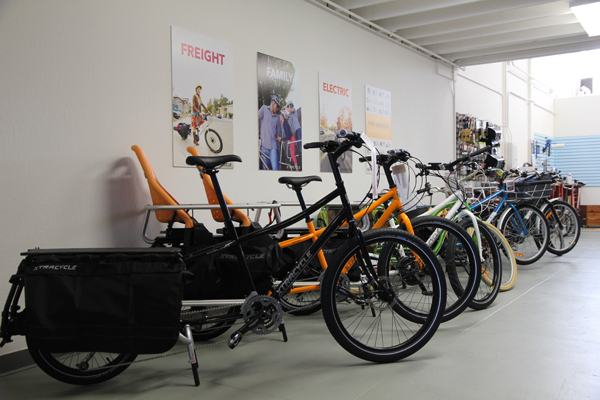 Furthermore, they sell great quality bikes: Tern and Brompton folding bikes, Swiss-made Stromer e-bikes, Oakland-based Xtracycle and Yuba cargo bikes, and nice accessories to go with the bikes. The target here is for everyday cycling with utility in mind. And any woman stepping into this shop is not going to shy away. They carry stylish bags and an equal number of bikes for females and males, which reflects the almost equal gender split of ridership in Oakland. Bromptons of all sorts! Oakland A’s in the top left and Cal Berkeley in the bottom right. I think someone just bought a SF Giant’s one. 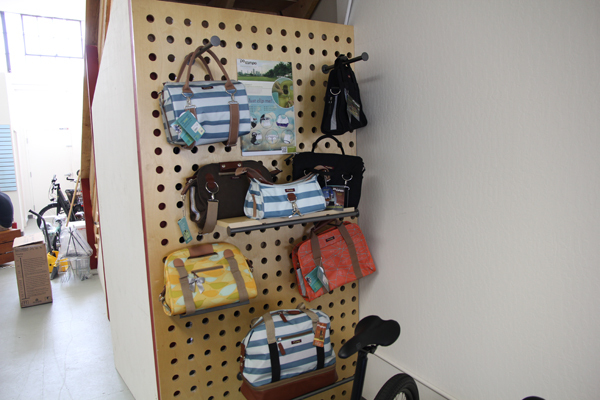 Stylish Po Campo bags for the ladies. Yes, they carry Brooks saddles too (not shown). 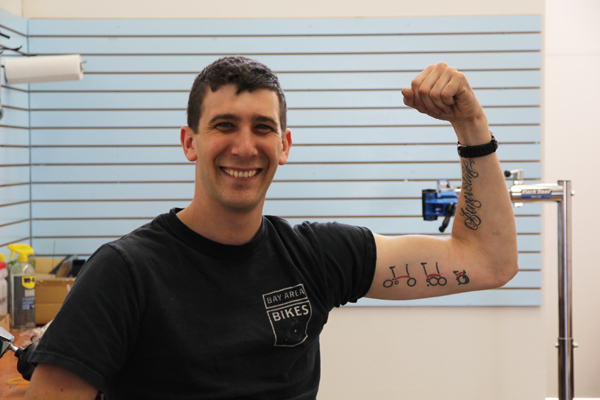 Clay has so much faith in Bromptons, so much that he has a real tattoo of it! Finally, when you talk to Clay, you will certainly feel like you bought the right bike because he only carries bikes that he believes in. Moreover, he has immense knowledge of his bikes and is happy to share his knowledge with you. He knows every little detail about the bikes he carries and can make an informed opinion for you if you like. Oh, his wife Glenda is super patient and I am glad for once there’s a woman working in a bike shop. If you have a love for Bromptons like I do, this is the place to go to!